The Only One Of All Anguilla Restaurants Out On A Ledge! Update: The Overlook has closed. Most of our favorite Anguilla restaurants are right on the beach or have a superb view of one! 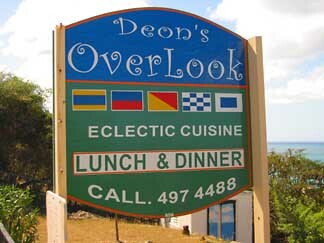 While the OverLook Restaurant is not on the beach, it has the most magnificent view of any restaurant in Anguilla. 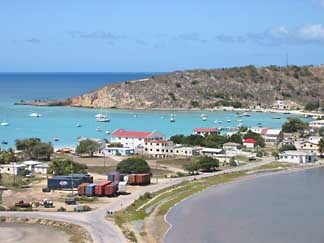 Which leads me to tell you why we were a little disappointed after our first two visits to Anguilla. Someone, we never got to eat at The Overlook. Each time our car cruised by (which was often -- my Dad always chooses the slower, scenic route), this colorful restaurant beckoned. But it was either closed (Deon leaves for Cape Cod in the summer!) or we had already eaten! Luckily, during our third trip, we made a point of not forgetting! 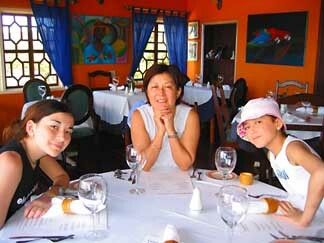 As soon as we were seated in their spectacular, vibrantly colored dining room, we felt "warm-at-home." And the view out the windows was spectacular. We were excited, happy... and hungry! The tropical breeze swished through the room, refreshing us, while we checked out the menu. My sister and I love fish and chips and Deon promised us he makes the best on the island (sure, that's what they all say -- little did I know he was right!). Orders out of the way, it was now time to daydream out the window at the breathtaking blue! The village of Sandy Ground looked so quaint from up high! And, the light blue harbour offset the dusty hills wonderfully. The fish and chips were indeed excellent! Crispy batter, tender fish (red snapper! ), and a whole mouthful of unique, delicious flavors (Deon spices the batter)! Just before we left, we were able to have another "quick" (my Dad's sort of "quick", in other words not quick at all), chat with Deon, the chef. 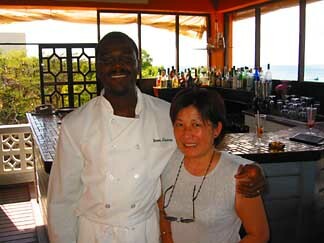 He told us a bit about what had become one of our favorite Anguilla restaurants, and then about his other one out in Martha's Vineyard! (Cape Cod! Another one of our favorite places... Boy, he sure has a hard life!). We continued chatting about different things. He's a very interesting fellow, and he makes you feel right at home, slightly shy himself and with the nicest smile. Choose The Overlook. Not only is the food and location outstanding (Flavor's is on the other side of the road), but Deon is a fun person to chat with! And when will you ever get to eat on the ledge of a cliff again? If you go, say hello for me! I really liked Deon. Update: Deon's is one of our favorites for breakfast, too!